Diabetes mellitus is a common condition in people and relatively common in cats as well. It is a chronic condition in which the body either isn’t making enough insulin or isn’t responding to the insulin being produced. Insulin, a hormone secreted by the pancreas, helps regulate blood sugar (glucose). Glucose is a by-product of the food our cats eat; it provides energy to the cells in their bodies. There are two common types of diabetes mellitus. The first type occurs when your cat’s body can’t produce enough insulin; this is called type 1 diabetes. The second type of diabetes occurs when the body doesn’t respond to insulin; this is called type 2 diabetes. This form of diabetes is more common in indoor, less active, and overweight kitties, just as it is with their human counterparts. The most common symptoms of diabetes are increased thirst (polydipsia) and increased urination (polyuria). Your veterinarian will perform a thorough physical exam and take a detailed history of your pet’s health. The symptoms of diabetes mellitus are very similar to other diseases, such as liver or kidney disease, pancreatitis, and hyperthyroidism. Additionally, sometimes underlying diseases or conditions can cause transient diabetes, and once the primary disease or condition is treated, the diabetes resolves. Your veterinarian may recommend diagnostic tests to identify the underlying cause of your cat’s symptoms. 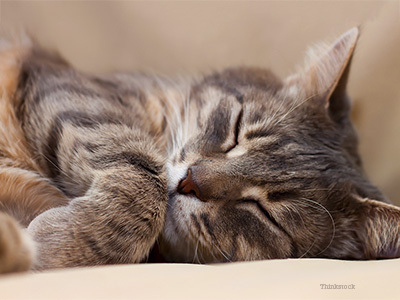 A good percentage of cats with type 2 diabetes that are treated with twice daily injections of a long-acting insulin preparation, a prescription diet and a weight-loss program, and then closely monitored with bloodwork including blood sugar and fructosamine levels can experience remission of their diabetes, at least for a period of time. Unlike in humans, oral diabetes drugs are not generally effective for feline patients, so are rarely the recommended therapy. Here are two videos, caring for your diabetic cat and giving injections to your pet, which may be useful to you. For more information about feline diabetes, visit My Cat Has Diabetes. Diabetes mellitus can lead to further complications, read about them here.